Timeless! That’s what comes to mind the moment the resonant voices of En Vogue pour through the airwaves. With their new single, Rocket, steadily pushing its way onto radio playlists across the country, the ladies are poised for more chart-topping success with the global release of their “Electric Café” album on Entertainment One Music. 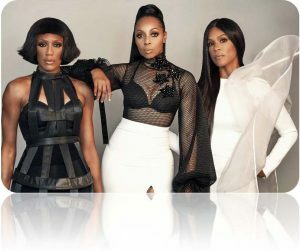 En Vogue, current members Cindy Herron-Braggs, Terry Ellis and Rhona Bennett are recognized as one of the top 5 highest selling American female music groups in history, En Vogue has sold over 20 million albums to date. Their effortless transition into the digital age, complemented by their effortless chic, has garnered the group over 30 million streams and 26 million plus YouTube views on their Top 6 hit singles alone; smashes such as Hold On, Free Your Mind, Never Gonna Get It, Giving Him Something He Can Feel, Don’t Let Go, and Whatta Man (feat. Salt N Pepa). In March 2018, the group will present their most diverse work yet with the release of the album “Electric Café.” “We were just looking for a vibe,” says founding member Cindy Herron-Braggs of the group’s first studio album since 2004. “In the beginning, we were feeling that electronic dance sound, but then the music started to evolve creatively.” Electric Café features collaborations with some of today’s most sought-after producers and artists, including Ne-Yo, who penned the lead single Rocket with production by Curtis “Sauce” Wilson and Raphael Saadiq, who wrote and produced the smoking hot track, I’m Good. throughout the United Kingdom, Holland and Germany. contemporary sound,” says Rhona Barrett. human trafficking and provide them with educational and job training. collection of music – timely.